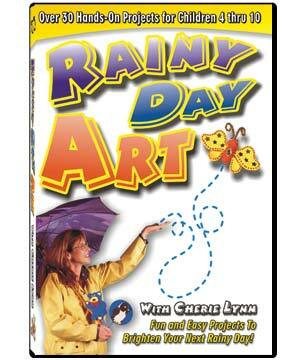 Spend a day with Cherie Lynn as she shows you and your kids how to have fun creating art. Follow along her step-by-step instruction to create your own journals and diaries, picture frames, murals, puppets, musical instruments, masks and more! Includes over 30 projects. Rainy Day Art provides hours of hands-on arts & crafts fun. No experience necessary! Each project is presented clearly and easily by veteran art teacher, Cherie Lynn. With over 20 years of teaching experience, she knows what projects kids will enjoy. Rainy Day Art includes both group and individual projects. A cool bonus feature is that you can pop the DVD into your computer and print out a shopping list. But don't worry, you're not going to have to spend an arm and a leg to start creating art - Cherie Lynn shows you how to use materials you probably already have lying around the house. Create colorful butterflies that can be worn or used as magnets. Make colorful, nifty frames for all your photos. Make your own journals and diaries. 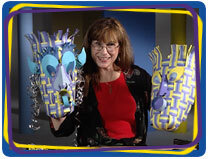 Discover how to turn a cool placemat project into wearable masks! Design abstract projects like these glitter circles. Learn a new design method and neat ways to apply it. Make some noise with one-of-a-kind music shakers.